Assigned status Up to Date by Cat Nguyen Burkat, MD FACS on June 11, 2018. Droopy upper eyelid or ptosis presents with substantial blockage of the upper part of field of vision, risk of amblyopia among young children, and an aging change in facial appearance. Blepharoptosis is an abnormal low-lying upper eyelid margin with the eye in primary gaze. Normally, the upper lid covers 1.0-2.0mm of the superior part of the cornea. Skin redundancy of the upper lid, or dermatochalasis, is a separate finding, and may occur in conjunction with blepharoptosis. Dermatochalasis should be distinguished from blepharoptosis as the surgical management differs. Blepharoptosis can be congenital or acquired. Congenital ptosis results usually from isolated localized myogenic dysgenesis levator palpebrae superioris. Very small number of congenital blepharoptosis may result from genetic or chromosomal defects, and neurologic dysfunction. Blepharophimosis syndrome which is characterized by short palpebral fissures, congenital ptosis, epicanthus inversus, and telecanthus. Congenital third cranial nerve palsy. Congenital Horner's syndrome which is characterized by mild ptosis, miosis, anhidrosis, and heterochromia. Marcus Gunn jaw-winking syndrome which results from misdirected innervations to the ipsilateral levator muscle by the motor nerve to the external pterygoid muscle. Patients have lid elevation with mastication or with movement of the jaw to the opposite side. Most cases of acquired blepharoptosis are of aponeurotic type. Aponeurotic blepharoptosis may result from stretching, dehiscence, or disinsertion of the levator aponeurosis. Aponeurotic blepharoptosis is commonly known as involutional ptosis in patients in which the anatomic changes are age-related. Myogenic, neurogenic, traumatic, mechanical are less frequent cause of acquired blepharoptosis. Myogenic blepharoptosis can be found in myasthenia gravis, chronic progressive external ophthalmoplegia, oculopharyngeal muscular dystrophy, and myotonic dystrophy. Neurogenic blepharoptosis may result from third nerve palsy, Horner's syndrome. Traumatic blepharoptosis may follow an eyelid laceration with transection of the upper eyelid elevators or disruption of the neural pathway. Mechanical ptosis can result from the presence of eyelid mass, such as neurofibroma or hemangioma or cicatrization secondary to inflammation or surgery. Levator palpebrae superioris and Mueller muscle Blepharoptosis are the upper eyelid elevator muscles. The levator palpebrae superioris originates from orbital apex and continues anteriorly, and at the Whitnall ligament, it travels inferiorly as an aponeurosis. . The aponeurosis inserts into the anterior aspect of the tarsal plate. It also sends attachments to the skin, forming the upper eyelid crease. The levator palpebrae superioris is a striated muscle that is innervated by the superior division of the oculomotor nerve. This muscle is the major elevator of the upper eyelid. The Mueller muscle, a sympathetically innervated smooth muscle, has its origins from the undersurface of the levator superioris. Approximately 12 mm long, it inserts superiorly on the tarsal border and elevates the upper eyelid by approximately 2 mm. Blepharoptosis results from dysfunction of one or both upper eyelid elevator muscles. Patients usually present with complaint of the involved eye being small, tired appearance, limitation of the field of vision, and headache. Acquired blepharoptosis can occur at any age, but it is commonly seen in older adults. Congenital blepharoptosis presents from birth. There is no racial or gender in predilection blepharoptosis. More details are needed in regards to the onset of ptosis, alleviating or aggravating factors, family history of ptosis, recent botulinum injection, and history of trauma or ocular surgery. History usually provides very good clue for the etiology of the belpharotposis. It is important to ask about any anticoagulant use or bleeding, a family history of malignant hyperthermia and cardiac disorders such to avoid potential complications during surgery. The palpebral fissure, which is the distance between the upper and lower eyelid in vertical alignment with the center of the pupil. The marginal reflex distance-1 (MRD-1), which is the distance between the center of the pupillary light reflex and the upper eyelid margin with the eye in primary gaze. The marginal reflex distance-2 (MRD-2), which is the distance between the center of the pupillary light reflex and the lower eyelid margin with the eye in primary gaze. Levator function, which is the distance the eyelid travel from downgaze to upgaze while the frontalis muscle is held inactive at the brow. A measurement of greater than 10 mm is considered excellent, whereas 0-5 mm is considered poor. Presence of eyelid crease and its height. In patients with unilateral blepharoptosis, the involved eyelid should be lifted manually and the contra-lateral eyelid needs to be observed for any masked blepharoptosis. Patient needs to be examined for proptosis or enophthalmos, lagophthalmos, and presence of Bell phenomenon. Ocular motility needs to be evaluated as some patients with blepharoptosis may have limited ocular motility such as in myasthenia gravis and chronic progressive external ophthalmoplegia. Patients with congenital blepharoptosis need to be examined for presence of Marcus Gunn jaw-winking syndrome. The pupillary size and the iris color differences between the eyes should be examined for Horner's syndrome. It is very important to examine for presence of dry eye with fluorescein stain to examine the cornea, tear meniscus, and tear break-up time. Sympathomimetic eyedrops can be used to stimulate the Mueller muscle. If a good response is observed, the ptosis may be repaired by Mueller muscle–conjunctival resection. Clinical examination is enough in majority of patients. Visual field is usually requested to show the impact of the blepharoptosis peripheral field of vision. In few patients laboratory and imaging studies are needed to find out the cause of the blepharoptosis. In patients with chronic progressive external ophthalmoplegia, an electrocardiogram, electroretinogram, electromyography, and mitochondrial assay should be considered. Patients having neurologic deficits along with blepharoptosis should undergo imaging of the brain, orbits, or cerebrovascular system. Patients suspected to have inflammatory or infiltrative orbital process as a cause of blepharoptosis need to have orbital CT or MRI scanning. In acquired Horner's syndrome, imaging of the head and neck is required. 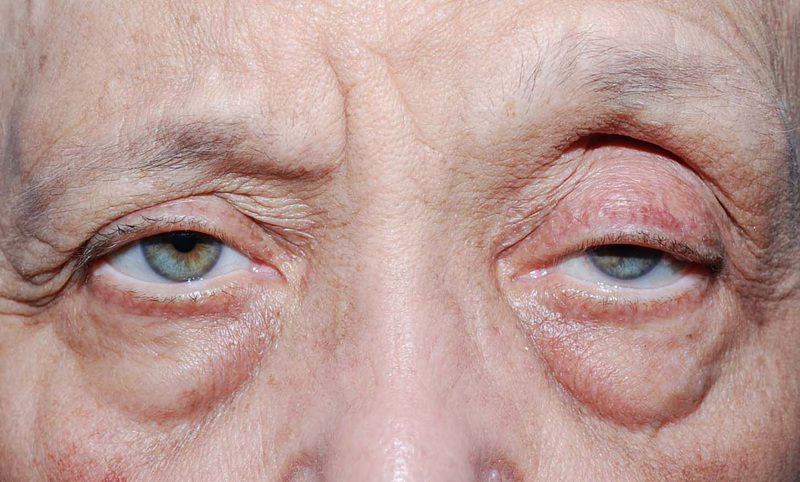 Pseudoptosis, which may result from microphthalmos, enophthalmos, anophthalmos, or contralateral eyelid retraction. Management of blepharoptosis is primarily surgical. Observation is only required in mild cases of congenital ptosis if no signs of amblyopia, strabismus, and abnormal head posture are present. If there is risk for amblyopia, strabismus, and substantial abnormal head posture, surgery is done as soon as possible. Blepharoptosis surgical correction can be done at any time for improving the field of vision or the aesthetic appearance. If blepharoptosis represents a sign of systemic disease such as myasthenia gravis and Kearns-Sayre disease, the patient should be referred to the appropriate physician for further management. External photographic documentation is good to obtain especial before attempting surgical correction. Patients with myasthenia gravis may improve with medical treatment. Sympathomimetic topical eye drops such as apraclonidine and phenylephrine provide short temporary lift of the upper eyelid in some patients. Surgical correction of congenital ptosis can be done at any age depending on the severity of the disease and early intervention is required if there is a risk for development of amblyopia or significant abnormal head position. Different surgical techniques are available for blepharoptosis correction. Depending on treatment goals, the underlying diagnosis, surgeon preference, and the degree of levator function, the appropriate technique is chosen. Patients need to be aware that symmetry is not easy to achieve. Great care should be taken for patients with dry eyes, decrease corneal sensation, absent Bell phenomenon, double elevator palsy, or progressive external ophthalmoplegia to avoid exposure keratopathy postoperatively. If the patient has strabismus and blepharoptosis, strabismus needs to be corrected first. The surgery is done from the conjunctival side where, the conjunctiva and the Müller muscle are marked (around 4mm of conjunctiva for 1mm correction of blepharoptosis from the tip of the upper tarsus), the marked conjunctiva and the Müller muscle area is clamped. Suture is passed under the clamp in continuous manner and externalized through the skin at both ends of the marked area, then, tissues above the clamp are resected. Fasanella-Servat ptosis correction is similar in technique. However, it involves resection of conjunctiva, Mueller muscle, as well as part of the upper tarsus. Including part of the tarsal plate in the resection creates a more powerful elevation. Care should be taken to avoid excessive removal of tarsus that could affect the integrity of the eyelid structure. The surgery is done through an eyelid crease incision. The orbital septum may be opened and preaponeroutic fat is retracted away levator aponeurosis. Dissection is done through orbicularis muscle to find the levator aponeurosis. Once it is identified, levator aponeurosis is disinserted from the tarsus and dissection may be continued between levator aponeurosis and Müller muscle. Levator aponeurosis is then advanced and/or resected, and fixed temporarily with 1 to 3 sutures to the tarsus with anterior lamellar bites. The amount of advancement and/or resection depends on the degree of blepharoptosis. If the patient is awake, the lid height and contour are examined at this stage. . Once a good height and contour are achieved, the tarsal lamellar bits are then tightened permanently. The skin is closed with incorporating part of the levator aponeurosis to reform the crease. This is done for patients with poor (<4 mm) or absent levator function. Many autogeneic and allogeneic materials are available be used as a sling. Fascia lata and frontalis muscle flaps, preserved (tissue bank) fascia lata, Gore-Tex suture, frozen dura mater, silicone, and Alloderm have been used. Autogeneous fascia lata was found to give the most favorable surgical result. The sling connects the eye lid with eye brow, and with the elevation of the eyebrow, the eye opens. Following surgery, patients may need several months to be able close their eyelids during sleep. A lot of lubrication is needed during this period. For patients with unilateral severe blepharoptosis, bilateral frontalis sling provide the best cosmetic outcome. However, it is often difficult to persuade the parents and the patient to perform surgery on the normal contralateral levator muscle. For patients with Marcus Gunn jaw-winking syndrome, the surgical correction technique of jaw-winking blepharoptosis is controversial. If the jaw-winking is insignificant, blepharoptosis correction alone (with levator advancement or frontalis sling) depending on the severity of the ptosis and levator function may be enough. If the jaw-winking is significant, extirpation of the levator muscle and placement of frontalis sling may be needed. The surgical correction of blepharoptosis is generally done as an outpatient procedure. While the patient is awake, apply cold compresses to the eyelids for 20 minutes every 1-2 hours for 2-3 days to decrease swelling and bruising. A topical antibiotic ointment (with or without a steroid) is given for the patients to be applied on the eye and the incision site twice daily for 5-7 days. For patients who are expected to have postoperative lagophthalmose, excessive lubrication is needed. Patients usually are seen 1 to 2 weeks following surgery. The patients are evaluated for signs of exposure keratopathy, infection, granuloma formation, and overcorrection and undercorrection. Patients with amblyopia, they need to continue amblyopia treatment. Congenital ptosis may lead to amblyopia secondary to deprivation or uncorrected astigmatism. Acquired blepharoptosis results in decreased field of vision and frontal headaches. Blepharoptosis causes significant psychosocial effects and may lead to poor performance in school and at work. Surgical correction of blepharoptosis may be complicated by bleeding, infection, edema, undercorrection or overcorrection of the ptosis, eyelid asymmetry, granuloma formation, corneal foreign body sensation, and exposure keratopathy. Majority of these complications can be managed easily if discovered early and the appropriate treatment provided. Good results are usually achieved by the medical and surgical approaches availabe for managing blepharoptosis. Recurrence over time is not uncommon. More than one surgery may be needed to achieve this result, especially in congenital ptosis. Boyd K, DeAngelis KD. Ptosis. American Academy of Ophthalmology. EyeSmart® Eye health. https://www.aao.org/eye-health/diseases/ptosis-list. Accessed March 22, 2019. Sakol PJ, Mannor G, Massaro BM. Congenital and acquired blepharoptosis. Curr Opin Ophthalmol. 1999;10:335-9. Cetinkaya A, Brannan PA. Ptosis repair options and algorithm. Curr Opin Ophthalmol. 2008;19:428-34. Small RG. The surgical treatment of unilateral severe congenital blepharoptosis: the controversy continues. Ophthal Plast Reconstr Surg. 2000;16:81-2. Baroody M, Holds JB, Vick VL. Advances in the diagnosis and treatment of ptosis. Curr Opin Ophthalmol. 2005;16:351-5. Frueh BR, Musch DC, McDonald HM. Efficacy and efficiency of a small-incision, minimal dissection procedure versus a traditional approach for correcting aponeurotic ptosis. Ophthalmology. 2004;111:2158-63. Baldwin HC, Manners RM. Congenital blepharoptosis: a literature review of the histology of levator palpebrae superioris muscle. Ophthal Plast Reconstr Surg. 2002;18:301-7. Lee MJ, Oh JY, Choung HK, Kim NJ, Sung MS, Khwarg SI. Frontalis sling operation using silicone rod compared with preserved fascia lata for congenital ptosis a three-year follow-up study. Ophthalmology. 2009;116:123-9. This page was last modified on April 4, 2019, at 15:59.